Hindustan Institute of Technology and Science Engineering Entrance Examination this is a National level selection test. Hindustan University, Chennai directs this HITSEEE test each year for admissions to UG (Engineering and Technology) programs. This online placement test is held crosswise over different urban areas crosswise over India. College anticipated hold HITSEEE 2018 confirmation test. Competitors can apply through online for different courses from January 2018. The admission to any program will be absolutely on the premise of the All India Rank in the entry exam. This University offers 36 UG and in addition 39 PG programmes in Engineering, innovation Management and Architecture. It is one of the Leading specialized foundations in the business. Click on the Register for HITSEEE 2018 Exam link on the home page. For B.Arch programme, the upper limit is 19 years as on April 30, 2018. Candidates must have passed 10+2 or equivalent with minimum 50% aggregate in Physics, Mathematics & Chemistry exam as prescribed by Tamil Nadu Government. If a candidate is vocational stream, the minimum requirement is 50% marks in the related subjects and vocational subjects (theory and practical). Candidate must have 10+2 or any equivalent exam with 50% having Mathematics as one of the subjects. We know by now that HITSEEE contains 3 main sections viz. Physics, Chemistry and Mathematics. It is essential for candidates to understand the pattern and syllabus of the exam before they plan their preparation. Physics –Optics, Semiconductor devices and their applications, Atomic and Nuclear Physics, Electromagnetic waves and wave optics, Magnetism and Magnetic effects of electric current, Dual Nature of Radiation and Matter, Current Electricity. Mathematics - Differential equations, Discrete mathematics, Complex numbers, Analytical geometry of three dimensions, Vector algebra, Probability distributions, Application of matrices and determinants, Integral calculus and its application. The admit card of HITSEEE 2018 is expected to be available for registered candidates from the fourth week of April 2018 onwards. The admit card is a very importnat document of the admission process and is also required to take the entrance. So, candidates need to keep it safe and in undamaged condition. Also, before downloading the HITSEEE 2018 admit card, the candidate must ensure that the details mentioned in it are correct. In case of any discrepancy, the candidate must contact admission authorities without delay. 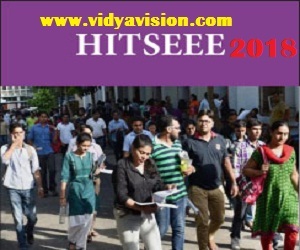 The result of HITSEEE 2018 will be released by Hindustan Institute of Technology and Science somewhere around May 2018. The HITSEEE 2018 result will be available in the form of a merit list that will contain the rank and mark obtained by the candidate, apart from the candidate’s name, roll number, and application number. The HITSEEE result 2018 will be available in online mode, which can be viewed and downloaded by entering one’s name and roll number or application number. The candidate needs to download and take a printout of the result as it will be required during counselling and to complete other admission formalities. The counselling of HITSEEE 2018 will be held for qualified candidates tentatively in the third week of May 2018. HITSEEE 2018 counselling and seat allotment will be done based on the All India rank (AIR) of the candidate in entrance examination, with candidates who are ranked higher getting preference over lower ranked candidates. Also, for seat allotment of HITSEEE 2018, choices opted by the candidate will also be taken into account.